HD Kumaraswamy seems to have forgotten he’s the Chief Minister of Karnataka. Instead, it’s his title of ‘Producer’ and the role of father that seem to weigh predominantly on his mind. 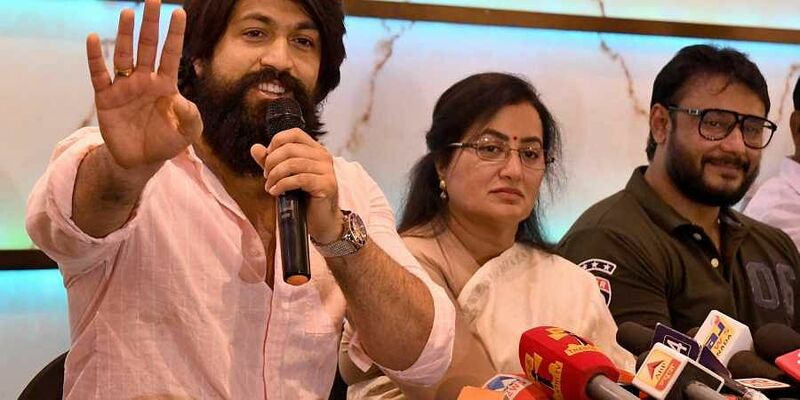 At a recent party meeting of the JD(S) in Mandya, an angry Kumaraswamy lashed out at Sandalwood actor Yash, who is supporting independent candidate Sumalatha against HDK’s son Nikhil Kumaraswamy in the constituency. “Without producers like us, they (actors like Yash) will not be able to survive,” Kumaraswamy said. The context was an alleged comment made by Yash, calling JD(S) a party of thieves. “Some guy named Yash has now come here and is saying that mine is a party of thieves. Even I am a film producer and I cannot believe I agreed to make films with such actors,” said HDK, whose former wife Radhika Kumaraswamy had produced Yash-starrer Lucky. “Without producers like us, they will not be able to survive. Do not believe that everything you see in films is true. What you go through every single day, that is the reality. I had given him respect and also a chance. I understand why the party workers are not raising their voice against people who are making negative statements about me. In every village, I see why the party workers are keeping quiet. They don’t want my name to be maligned,” he said. 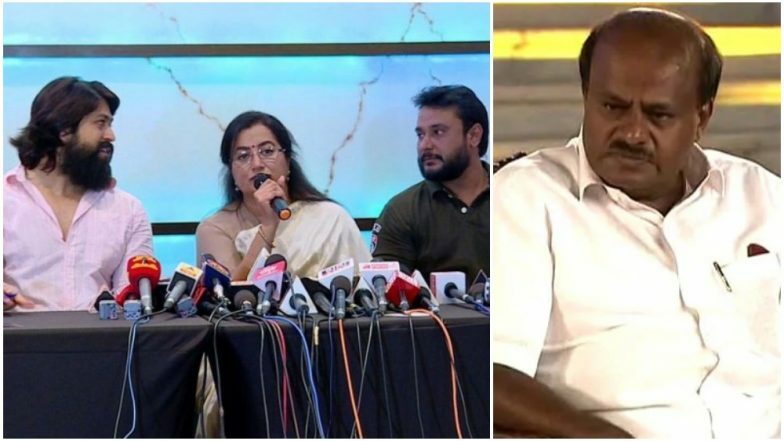 The Chief Minister also took a pot shot at Sumalatha Ambareesh, alleging that she had not wanted Amabareesh’s body to be brought to Mandya for his last rites. “When Ambaressh had died, that lady (referring to Sumalatha) had taken people aside and told them that Ambareesh’s body must not be taken to Mandya at any cost. Now see how she is putting on an act,” he added. Sumalatha, wife of former Congress MP Ambareesh is contesting as an independent with the support of the BJP. Her star campaigners are Kannada actors Darshan and Yash. Over the last two weeks, Yash has been campaigning aggressively on behalf of Sumalatha. Both the Chief Minister and Yash have taken digs at each other whilst campaigning. However, Yash has firmly denied calling JD(S) a party of thieves. “I am always clear in my statements. I never called anyone a thief or any party as the party of the thieves. If anyone proves that I made such a statement, I will bow down to his commands,” Yash told the media on Monday. This is not the first time a JD(S) leader has threatened the careers of actors supporting Sumalatha. Earlier in March, the KR Pete Police had registered an FIR against JD(S) MLA Narayana Gowda for intimidating Yash and Darshan. “It’s because of the people who buy movie tickets that the cinema industry is flourishing. Those in the film industry must respect the people. If they continue to go against us (referring to JD(S)), we will begin an investigation into how they earned so much money. We are running the government, so stay at home respectfully,” he had said. Speculation is rife in Mandya that if Sumalatha loses the elections, actors Yash and Darshan’s career in Sandalwood would be threatened. Political party insiders say that Yash took the risk as he is aspiring to enter politics in Mandya and may even join the BJP after the Lok Sabha elections. Before he became the Chief Minister of Karnataka in 2006, Kumaraswamy ran Channambika Films, a production company. When he became CM, he made his wife Anitha Kumaraswamy the director of the firm. His affidavit filed in 2018 shows he has loaned money to several film production houses including Channambika films and had stated that he had invested Rs 2.89 crore rupees in the production house run by his wife.